Place the chicken in a saucepan and cover with cold water. Place over medium heat and bring to a simmer. Cook, turning once, for 10 minutes or until cooked through. Drain and set aside for 15 minutes to cool. Coarsely shred. 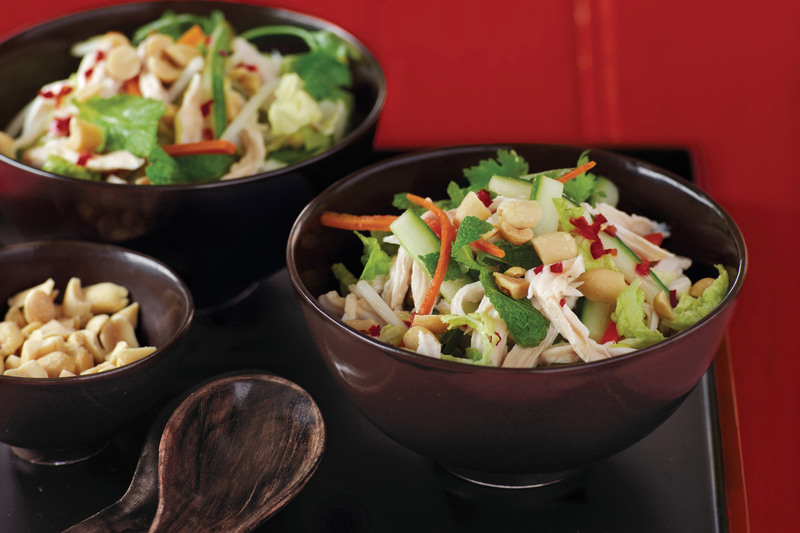 Combine the wombok, mint, coriander, carrot, cucumber, shallot and bean sprouts in a bowl. Whisk the chilli, lime juice, fish sauce and sugar in a small jug. Add the chicken to the salad and toss to combine. Drizzle over dressing. Divide among serving bowls and sprinkle with peanuts to serve. Wow my country's famous dish! Always love it! Yummy!